Blogger: Kai Hattendorf, UFI Managing Director. These are momentous times. On top of all that is driving our industry’s agenda, from digitalisation to transformation, now comes the result of the British referendum where the majority of voters stated their desire for the United Kingdom to leave the European Union. Our industry media is full of reports, comments, and speculations about what might come next – and you’ll find UFI’s position, published hours after the results were known, on this Blog. If you want to join the discussion, please do so on UFI’s social media channels. In the days just before this referendum, we held our annual European Open Seminar, or European Congress, in Basel. From a tour around Art Basel to the launch of the UFI Running Club, from networking events and enlightening congress sessions to a grand birthday party celebrating 100 years of the MCH Group, a lot of activities were packed into the three-day conference. The sidelines of the event also turned into a gathering of many eventtech companies, networking and sharing offers and ideas. If you want to revisit UFI Basel, you will find photo galleries at www.ufi.org. 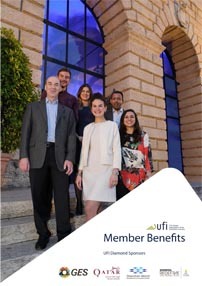 Session videos will follow soon, as usual, and will be available in the member section of the UFI website. With the Basel event now successfully closed, UFI is increasingly focusing on the 83rd UFI Congress next November in Shanghai (#ufishanghai). Please check the UFI website in the days to come, as we will launch the Congress website, including a registration platform where you can sign up. This year’s Congress theme will be “Ripples – The Exhibition Industry in Transformation”. Over the past 25 years, the exhibition industry has benefited from globalisation; from markets and cultures opening up. Now, times are more complicated: digitalisation is changing businesses globally at an ever-faster pace. The political climate in vital global markets is also changing – stability is being replaced with uncertainty. Most of our keynote speakers are already signed up, and I look forward to sharing more about the Shanghai programme and the Congress activities in the weeks to come (and yes, there will be a UFI Running Club in Shanghai, too! ), as we work through the next few month both in China and in Europe to prepare the event.